Milk. It’s one of the things I’m asked about most often as a vegan – do I miss it? What do I use instead of it? How do I make it? In all honesty, I don’t miss it. I was never a huge fan of dairy when I was vegetarian so giving it up wasn’t a big deal for me. That said, I’m aware that I’m definitely in the minority on this point! And I can’t deny that having something milky to drink is really comforting sometimes. Whether you use it for cereal, tea or just as a drink on its own, milk is a necessity if you’re going plant-based or just trying to cut out dairy. 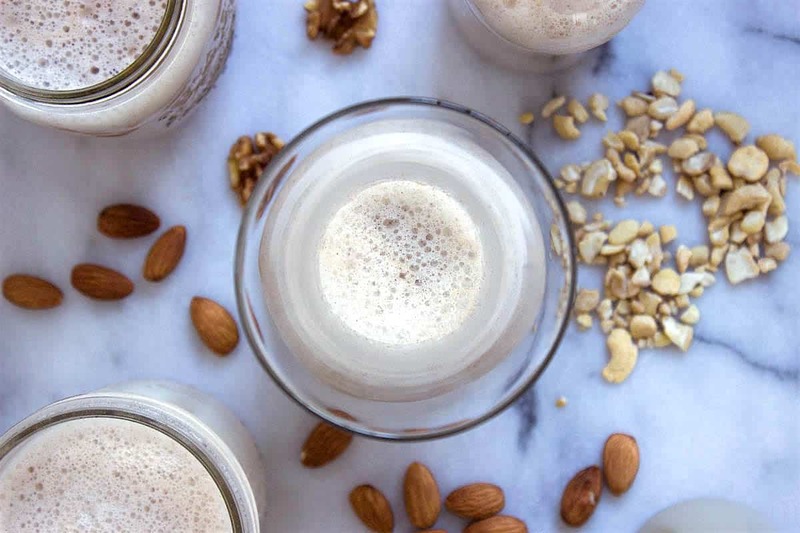 There are a variety of plant-based milks on the market which are great for the everyday, but if you have a little time and are looking for something more nutritious and delicious, I’d highly recommend making your own. Store-bought milks are usually full of fillers, contain very few nuts and taste pretty bland. It’s so easy to make your own, and you’ll usually find it works out at a similar cost or cheaper. 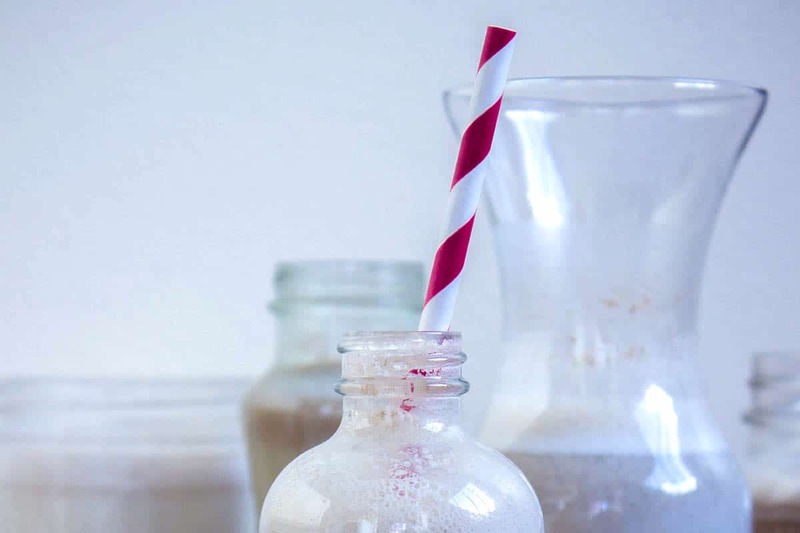 Below you’ll find my basic recipe which can be adapted for any type of plant-based milk. I’ve also costed out the most common nuts and seeds used in plant-based milks so that you can compare prices and find what you’re comfortable with. Finally, you’ll find some helpful FAQs at the end of this article – these are things I get asked all the time so hopefully they’ll answer any questions you may have! After soaking your nuts or seeds for the required amount of time (this step is optional – see individual nuts/seeds below for soaking times) strain and rinse them and add to a high-speed blender with the water, dates and any other add-ons you pick from the list (or add your own). Blend on high power for about 1 minute. Remove from the blender and strain the milk through cheesecloth or a nut milk bag (this step is optional too – see FAQs below). Store the milk in an airtight container in the refrigerator for about 4 days, and enjoy! 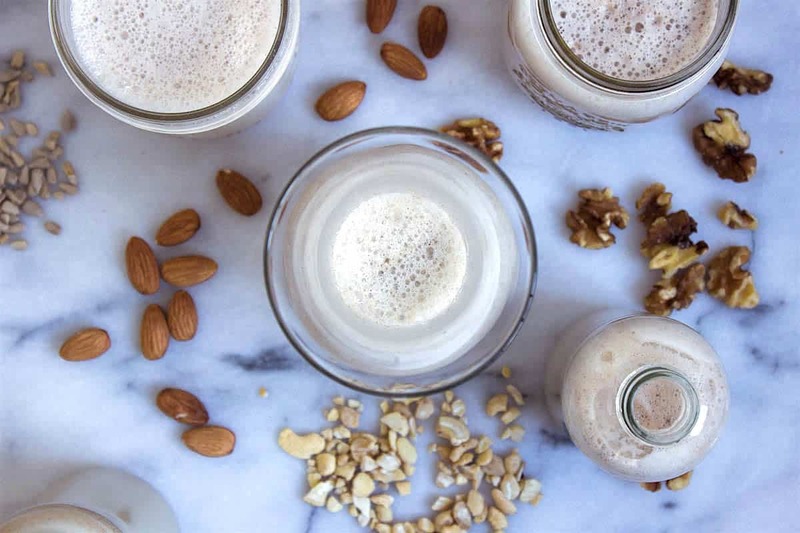 Here I’ve listed the six most commonly used seeds and nuts in plant-based milks. I’ve given their price per ¼ cup (enough for the basic recipe above) and the amount of time they need to be soaked for. Soaking seeds and nuts in water is absolutely not compulsory! – but it does make their nutrients more bioavailable which basically means we absorb them better into our bodies. Plus for milk purposes, it also makes the nuts and seeds a lot softer and easier to blend. A note on prices: those listed below are the current prices of each organic seed and nut in the bulk section of Whole Foods in Canada. They are by no means the cheapest seller (see my FAQs below), and they’re more expensive because they’re organic, but this is just an example of standardised prices to show how different nuts compare to each other. 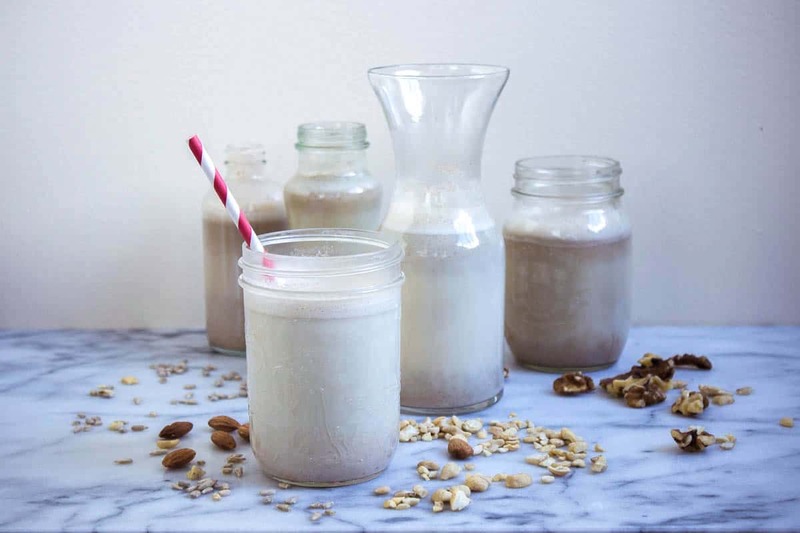 I don’t have a Vitamix or a high-powered blender, just a regular one – which milk should I make? – You can make any, but I’d definitely recommend soaking your seeds or nuts beforehand. This will ensure they’re softer and easier for your blender to break down. I’d also recommend straining the milk after blending, as your blender will probably leave behind slightly larger pieces of fibre. Finally, your blender may struggle with dates – I’d suggest using coconut nectar or maple syrup as your sweetener instead. I don’t have time to soak nuts and seeds. Which milk should I make? Which nuts/seeds do I need to strain after blending? – All except hemp and maybe cashew. Straining the milk is totally optional, but it does get rid of the little bits of fibre that even a Vitamix can’t totally break down. Which nuts or seeds taste best as milk? – It’s down to personal taste, but a general rule of thumb is that the more expensive the nut is, the creamier/richer it tastes. Sunflower seeds create quite a neutral-tasting milk, whereas hazelnuts have a very strong, rich flavour. Where can I buy nuts and seeds more cheaply? – Good question! Costco is a great place to get cheap nuts, as are local ethnic or specialist foodstores, and stores that sell them in bulk. The bulk section is always cheaper than buying nuts pre-packaged. If you’re looking to make the cheapest milk possible, I’d recommend making sunflower seed milk. These seeds are full of vitamin E, selenium and magnesium. They’re totally underrated because they’re a bit bland in flavour, but are really good for you and are way cheaper than any other nut or seed milk! Hemp can also be fairly cost-effective.